Look, I'll be honest, the only thing I really understand about this movie is that I love it. Starting with the swingin' 60s intro music that includes a spoken conversational break-down between a man and a woman that goes something like "Look, what's that up ahead? It's the future!" "Come on, everybody, let's embrace it!" to the fact that the name of the monster in this Japanese movie is filled with Ls, which are hard for Japanese folks to say, this movie is a masterpiece of oddity. 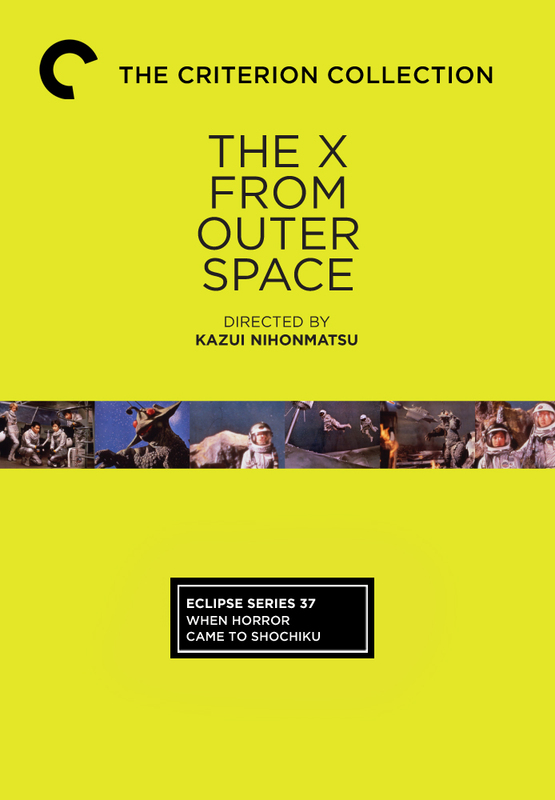 An entry in the Japanese kaiju genre (translation: "big friggin' monsters stompin' on stuff"), of which Godzilla is the most famous example, The X from Outer Space is about a group of Japanese astronauts (and one white girl) flying back and forth from Earth to Mars and the moon, maybe, while being regular 60s swingers. I think it takes them about a half hour to get to the moon, so when they return to Earth and figure out they forgot something, they just hop back on their ship and pop back to the moon real fast. On one of their trips, though, they get some gunk on their spaceship and it turns out to be an egg for a big monster that wants to get in on the action and step on Tokyo. Stepping on Tokyo is like the Super Bowl for giant alien/radioactive/mutated creatures. This particular monster's name is Guilala, and he's a giant space-chicken. Not kidding. Not one bit. He eats nuclear fuel, spits fireballs, and his only weakness is this foam that looks like fire extinguisher filler called "guilalanium," which causes him to shrink. This movie is bad in a very unique and magical way, and deserves to be more widely known. You could think of this as the Plan 9 from Outer Space of kaiju movies -- it's not "good" in any reasonable sense of the word, but there are definitely worse movies, and this one lives at the intersection of terrible and entertaining that makes it a truly rare bird of cult movies. I caught this on TCM Underground a few years ago, and it's not on DVD. If you have a subscription, you can watch it on Hulu, thanks to their deal with Criterion. Penalties: None. Like Billy the Kid vs. Dracula, if the description above sounds like a movie you'd enjoy, then there's no reason to dock it points for things like coherence, logic, or production value.